The Newton Rapshon method is used in mathematics to find approximations to the roots of an equation. f(x) we approximate a such that f(a)=0 and a is called the root of the equation. Newton's method can be applied on any equation but it is generally used on equations for which the calculation of the root is otherwise difficult. after few iterations we get a very close approximation of the exact root. For a demonstration, let the function be: f(x) = x2-10. Now we know that the square root of 10 is 3.16228 but let's see how good the Newton's method approximates it. which is a root of the equation and we found it in just two iterations. Newton's method depends on how good your initial approximation was and converges very fast to the actual root. 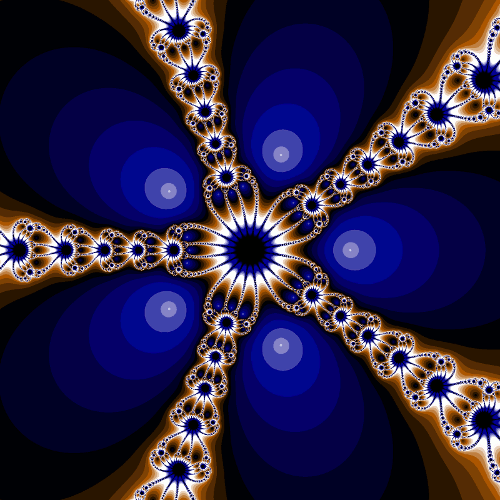 If however you start with a bad approximation, more interesting things will happen which are the base of this beautiful fractal. Loop through each pixel of the image. For each pixel, scale the (x,y) in range [-2.5,2.5] and make a complex number scaled_x + (scaled_y)i which corresponds to a0. Pass this a0 iteratively to the Newton's function and loop until the root is found or a set number of MAXIMUM_ITERATIONS are reached. After this there are many ways to color it like by the number of iterations taken or by the nearest root or using both of these. Let's start by the simplest of them. In this method we map the number of iterations to a hue from [0˚,360˚] or [0,1] keeping the saturation and brightness constant and color the pixel accordingly. Here's is the code for making the fractal for z5-1. The code can be easily tweaked to make fractals of any degree of type zn-1. In this method we map the number of iterations to shades of gray. Here's is the code for making the fractal for z3-1. 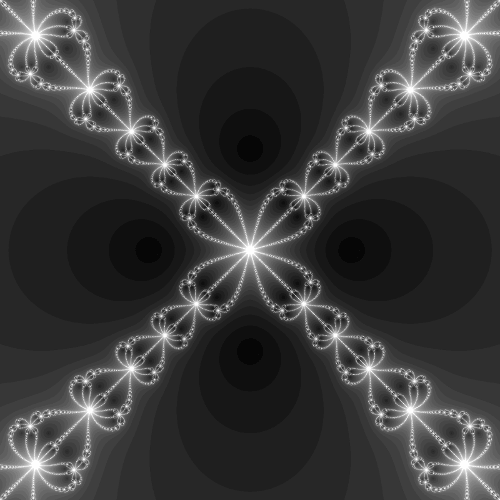 The code can be easily tweaked to make fractals of any degree of type zn-1. In this method we map the number of iterations to a custom color palette. Here's is the code for making the fractal for z5-1. 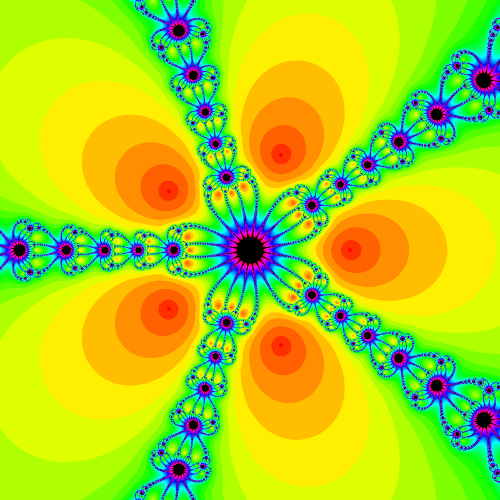 The code can be easily tweaked to make fractals of any degree of type zn-1. 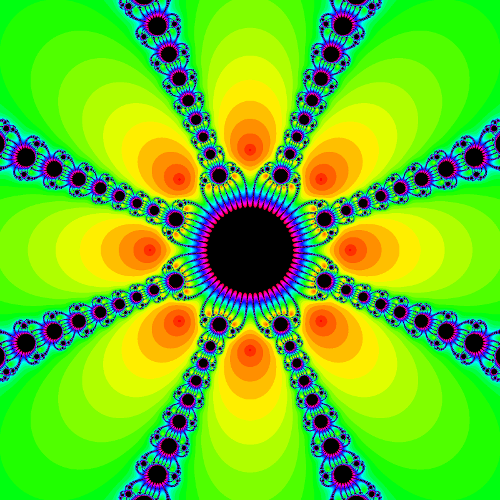 All of these fractals are beautiful but a visible flaw in all of them is that the color transition is not continuous. In the upcoming articles I'll describe the removal of color edges, coloring by root and many more cool things. Stay tuned. If you learnt something from this article, please share it. Sharing is caring.